Oxygenated Cleaner and Degreaser is a concentrated heavy duty cleaner, degreaser, deodorizer and stain remover. 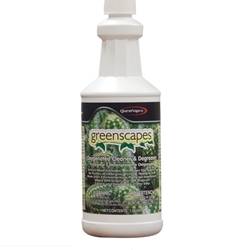 Contains hydrogen peroxide, biodegradable surfactants and degreasers and has a mild citrus odor. Leaves no residue, rinses freely with water. Contains no caustic or harmful solvents. For use on walls, floors, tile, vinyl upholstery, metal, porcelain, concrete, and counter tops. Removes grease, oil, grime, soap scum, lipstick, wax, food stains and dirt. Excellent for use as general purpose carpet spotter. Can also be used as a pre-spotter on soiled clothing prior to laundering. loosen soil, agitate if necessary with a scrub pad or brush, rinse and let air dry.